Short videos of our China trip 2016, 2017. Everyone is welcome to train and travel with us. Don’t wait to realize one of the dreams in your life! Beijing is a very cultured city coupled with its historical sites and modern architecture that beautifully sets its own character that everyone falls in love with. Food is excellent! Night life ranges from bars, shows, to great massages which you can fully enjoy the culture and relax in Asian ways…More importantly, we’ll train Internal Martial Arts with the best! Wu Dang Mountain is the home of the Tao with its complex temples in breathtaking mountain scenery, we’ll be there doing a Taoist Meditation Retreat that will bring you a once in a lifetime experience! Shanghai is a legendary city in history with new development. Tokyo extension: Travel with us, pay on your own. Shanghai to Tokyo on Oct. 29, return home on Nov. 2. Oct. 15 - Arrival Beijing - A Welcome dinner at 6pm. Oct. 16 - Training Tai Chi, Ba Gua Zhang, XingYi Quan by Master Li Gen Yin, and Liu Jing Ru & Han Yan Wu. Visiting Temple of Heaven in the afternoon. Oct. 17 - Training Tai Chi, Ba Gua Zhang, Xing Yi Quan by Master Li Gen Yin, and Liu Jing Ru & Han Yan Wu. Visiting Forbidden City in the afternoon. Beijing Duck Dinner. Oct. 18 - The Great Wall & Hot Pot Dinner. Oct. 19 - Training Tai Chi, Ba Gua Zhang, Xing Yi Quan by Master Li Gen Yin, Liu Jing Ru & Han Yan Wu. White cloud Temple in the afternoon. Oct. 20 - CA1385 18;15 - 20:35 Flight to Wu Dang Mountain. Oct. 21 - Taoist Meditation Retreat at Wu Dang Mountain. Oct. 22 - Taoist Meditation Retreat at Wu Dang Mountain. Oct. 23 - Taoist Meditation Retreat at Wu Dang Mountain. Oct. 24 - Taoist Meditation Retreat at Wu Dang Mountain. Oct. 25 - Taoist Meditation Retreat at Wu Dang Mountain. Oct. 26 - Taoist Meditation Retreat at Wu Dang Mountain. Taoist Meditation Retreat with Taoist Priest Chen Li Sheng & Frank Allen. There are 2 hours of Medication sessions everyday and there will be plenty personal time to spend at the Wu Dang Mountain. Oct. 27 - 9C8724 19:45 - 22:05 Flight to ShangHai. Oct. 28 - Free time in ShangHai. Note: There are 2 classes a day, from 9:00am - 11:00am, Xing Yi Spear & 11:00am - 1:00pm Tai Chi Straight Sword. You will have entire afternoon to explore the city, the culture, or just relax every day in Beijing. 4-star hotels with double occupancy in Beijing, Wu Dang Mountain, and Shanghai. Tuition on studying Taijiquan (Tai Chi), Ba Gua Zhang, Xing Yi Quan. Taoist Meditation. A training certificate presented by Masters. Airplane tickets from Beijing to Wu Dang Mountain, and to Shanghai. Transportations between the airports to hotels. Special meals as indicated in the itinerary and all breakfasts in the hotels are included. Not including: Airfare from anywhere in the world to Beijing, return from Shanghai. Chinese visa. Additional charge of $690 for a single room supplement. All lunches and dinners are not included unless indicated in the itinerary. Please prepare some cash for your healthy meals. Airplane tickets form Beijing to Wu Dang Mountain, & Wu Dang Mountain to Shanghai. Transportations between the airports and hotels. Special meals as indicated in the itinerary and all breakfasts in the hotels are included. Not including: Round trip airfare from anywhere in the world to Beijing. Chinese visa. Additional charge of $690 for a single room supplement. All lunches and dinners are not included, unless indicated in the itinerary. Please prepare some cash for your healthy meals. A non-refundable deposit $300 due Mar. 31, 2019. Payment of $1000 is due Jun.15 for purchasing domestic tickets, secure hotel bookings, and other operations in China. Total payment due Sept. 15, 2019. A transition fee of 3.5% will apply for Credit card or PayPal payment. 50% of the total payment will be refunded if the cancelation is made on/before Oct. 1, 2019. No refund if the cancelation is made after Oct. 1, 2019. 2. Purchasing a round trip airline's ticket fly into Beijing and back your home from Shanghai. Try to book early to get cheaper fare. We’ll extend our stay in Tokyo from Oct. 29 to Nov. 2. The plan for visiting Tokyo includes: The city, a day-trip to Mt. Fiji area, a visit either Nezu Shrine 根津神社 or Hie Shrine 日枝神社. All expense is on your own. 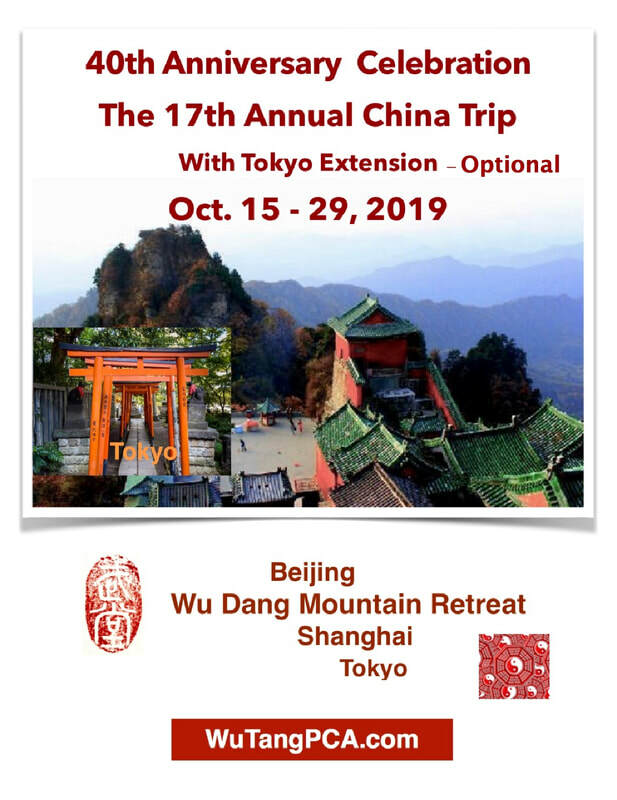 If you are taking the Tokyo extension, please contact Tina Zhang before you book your international flight. Feel free to join us.